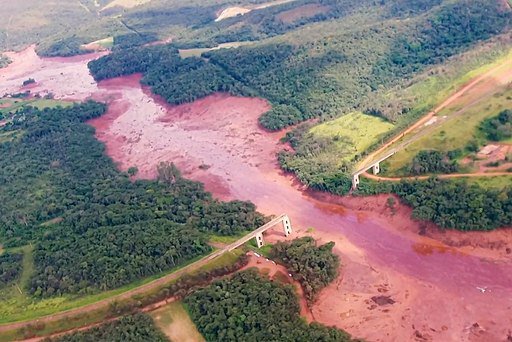 Aftermath of the Brumadinho dam collapse, 26 January 2019. Credit: Wikimedia/YouTube. CC BY 3.0. Brazil is at crossroads. The recently elected President Jair Bolsonaro has made no apology for his brazenly anti-environmental approach, aimed squarely at the expansion of agribusiness and the exploitation of primary commodities - this in a country filled with expensive and poorly constructed infrastructure projects, permeated by human rights and environmental violations and with little or no oversight. But despite efforts to assign blame, the reality is that arresting a few Vale employees will not address the root causes of the problem. Though technical negligence may have played a part, there are much more systemic issues at play. No disaster is ‘natural’ - so could the Brumadinho dam collapse more accurately be framed as a crime against nature and humanity? Last week in Davos, President Bolsonaro spoke about Brazil’s status as a world leader on environmental protection, but the images of a tsunami of mud and toxic mining tailings engulfing Brumadinho made his words ring hollow. His administration has a lot in common with the Trump White House, which has also been criticised for its attitude towards environmental concerns. Some argue that a religious ideology of “dominionism” underpins the environmental position that many conservatives adhere to - the idea that human beings have the right to exploit the earth and all other life-forms.